There appears to be a growing bipartisan consensus that we’re over-testing our state’s public school students. There’s also increasing scrutiny over how those standardized tests are being used to assign A-F letter grades to schools and to set pay for teachers and principals. 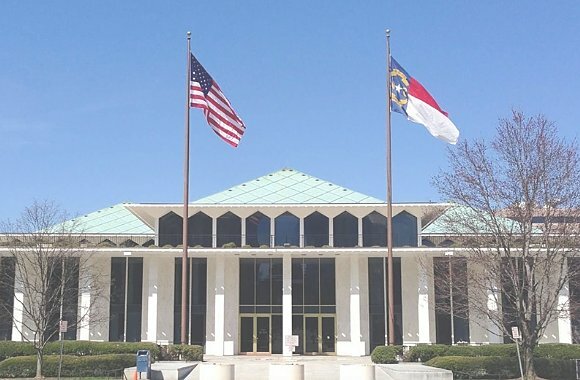 This week we talk with two legislators who are both NC classroom teachers and are backing efforts in the House for changes. We also continue our State Superintendent candidate interviews with James Barrett, a member of the Chapel Hill-Carrboro City Schools Board of Education. Two bills filed by Senate leaders this week are aimed at expanding options outside traditional public schools, coming at a time of increased attention to the adequacy and equity of state investment in public education. As we said in this year’s Top Ten Education Issues, vouchers and charters, which are now increasinglylargely operated by for-profit companies, have commonly been touted as the alternative to under-resourced public schools, and have expanded rapidly across the state in recent years.. However, these reforms lack any meaningful oversight, often fail to ensure high quality educational alternatives and instead divert taxpayer dollars away from the public schools and into the hands of for-profit entities. The emphasis on nebulous values of proficiency, choice, and competition have, in many ways, led us astray from the intended purpose of supporting strong public schools to serve the public good. We want to draw your attention to these two bills this week. Senate Bill 522, introduced by Senator Jerry Tillman, offers numerous changes to charter school law and resurrects language from a bill passed by the House two years ago that would allow corporations to essentially purchase seats at publicly funded charter schools exclusively for their employees’ children. With a minimum donation valued at $50,000, a company authorized to do business in the state of North Carolina can either give land, a school building, or make major renovations to an existing charter school facility or invest in its technology infrastructure. In return, the children of the corporation’s employees would receive enrollment priority for 50% of the charter school’s seats. Persons associated with the company, named in the bill as the “charter partner,” are eligible for membership on the charter school’s board of directors. Company employees cannot comprise a majority of the board, however. The “company charter school” language in Tillman’s bill sparked outrage even among charter school advocates two years ago. Eric Grunden, founder and Chief School Officer of Research Triangle High School in Durham, appeared on Education Matters along with the chair of the Charter School Advisory Board, Alex Quigley to speak out against the legislation. They said that promoting the concept of company charter schools is not consistent with the original spirit of charter schools, which is to expand opportunities for all students. We agree, and we believe that allowing private companies to buy seats at publicly-funded charters doesn’t serve the best interests of the public good in the state of North Carolina. Enables charter schools to tap new funding streams — including public dollars — for capital needs. Currently charter schools must seek out private funding for capital expenses. SB 522 would allow charters to begin accessing public dollars to build or renovate facilities by way of county funds and the state’s Need-Based Public School Capital Fund. Private activity bonds would be another new funding stream that would have to be approved by State Superintendent for Public Instruction Mark Johnson. Includes more robust standards for criminal background checks. A bright spot in SB 522, with this provision all members of a proposed charter school’s board of directors would have to undergo a nationwide background check. Allows higher education institutions to authorize new charter schools. Only the State Board of Education, with the recommendation of the state’s Charter School Advisory Board, can currently authorize the opening and closing of charter schools. This language would enable the boards of trustees of the state’s community colleges and UNC schools to authorize new charter schools, possibly paving the way for a substantial uptick in the number of charter schools operating in NC. Removes the cap on enrollment growth at for-profit virtual charter schools. 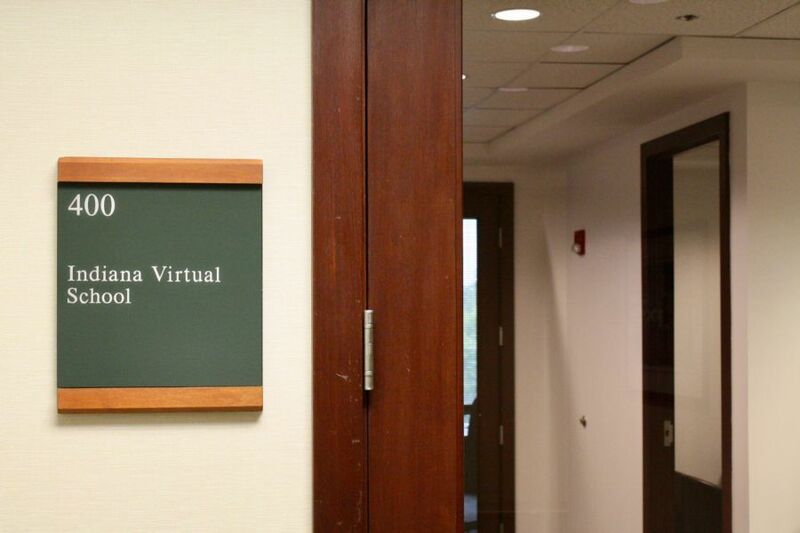 The state’s two for-profit backed virtual charter schools have performed poorly during their four-4 year pilot period, but despite these results, the General Assembly has given them the green light to operate for four more years. This legislation takes things one step further and removes the 2,592 student enrollment cap, allowing them to continue to expand by 20% each year, indefinitely. 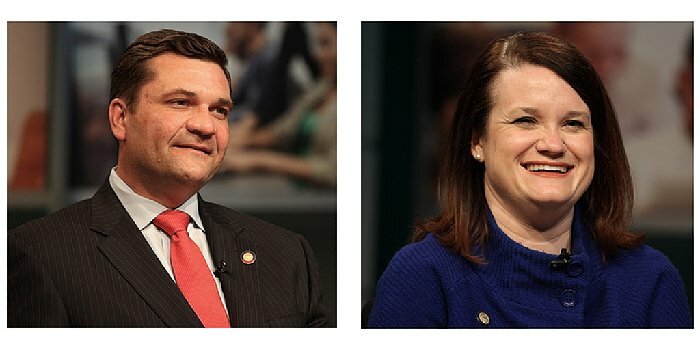 Following Senate leader Phil Berger’s promise earlier this year to “loosen the rules” of the state’s school voucher program following reports that millions of dollars were not being spent, Senate Bill 609 does just that by changing various eligibility requirements so that a wider population of students can qualify for vouchers. The bill makes no new appropriations for the programs, however, which have left millions of taxpayer funds left unspent over the past several years. It also includes no provisions to boost transparency and accountability for vouchers, which are notorious for their lack of oversight. Lifts income eligibility requirements. SB 609 changes eligibility requirements to allow families with household incomes that are 150% or less of the amount to qualify for the federal free and reduced lunch program to be eligible for traditional school vouchers, or Opportunity Scholarships. Currently families must earn 133% or less of that qualifying amount. Removes public school attendance requirement. This change is only for the Disability Grants voucher program. Language in the bill makes it so that a student with a disability no longer has to have attended a public school previously in order to qualify for a voucher. That requirement still exists for the traditional voucher program, however, unless the student is in kindergarten or first grade. Summary: HB 315 would change the current process for the selection of instructional materials, transferring the responsibility for selection and adoption of school instructional materials (including textbooks and digital resources) from the State Board of Education to local school boards. If the bill passes, local boards could select and adopt any instructional materials that align with the standard course of study to use in their schools. This bill would also allow groups or individuals– including parents, teachers, and any other citizen– to challenge the choices of curricular materials if they are perceived to be “unfit.” Concerns over this bill include increasing burden on local school boards, greater financial cost because of the loss of bulk purchasing power for the state, and the potential increase of challenges to textbooks and other materials based on subjective beliefs of members of the public. prohibit local boards of education from requiring the completion of a graduation project as a condition of graduation. This bill represents sweeping changes to the state’s current testing program, responding in part to calls from some parents and educators to reduce stress over high stakes testing. However, it does not address an even more central root of this stress–the A-F grading system–which punishes and stigmatizes schools and educators, particularly those serving children in poverty, based on a flawed formula for measuring student performance. We covered proposed bills that address the A-F school grading system in last week’s Friday report. Senate Bill 438 – Excellent Public Schools Act of 2019. Summary: This bill would make changes to the Read to Achieve program, which was created by the General Assembly in 2012 with the stated aim of improving early grade reading proficiency. However, a study by researchers at NC State released last year showed no positive impacts of the program after the first five years of implementation, despite the fact that the state has already spent over $150 million on the program. The legislation does not include any additional funding for the program. expanding the WolfPack Works program, a partnership with NC State intended to support beginning K-2 teachers in reading instruction. Senate Bill 580: Classroom Supplies to Teachers. Status: Re-ref to Education/Higher Education. Summary: Senate Bill 580 would change the ways that school districts and teachers receive funds for school supplies through the creation of the North Carolina Classroom Supply Program. Instead of school districts receiving the all of these funds by way of the the Classroom Materials/Instructional Supplies/Equipment allotment, a majority of the state dollars ($37 million of a total $47 million) currently appropriated for supplies would be redirected to classroom teachers through an app called ClassWallet. This app would allocate $400 to each teacher, and would require that they use the app to access these funds. This bill does not provide additional state funding for classroom supplies, which has seen massive cuts over the past ten years, and would make it much more challenging for districts to purchase needed items in bulk, which can often be done at lower cost than at retail stores. Teachers who expressed concern over this bill on Wednesday fear that it is likely to further reduce already scarce resources for schools, teachers and students. James (Jim) and Barbara Goodmon are the recipients of the 2019 Public School Forum of North Carolina Jay Robinson Education Leadership Award. The Forum established the award in 2000 to recognize leaders who have demonstrated innovative, creative, and effective leadership for public education in North Carolina. Mr. and Mrs. Goodmon will be honored at a gala event on Thursday, May 30, at the Raleigh Convention Center. Jim Goodmon, chairman and CEO of Capitol Broadcasting Company, and Barbara Goodmon, president of the A.J. Fletcher Foundation, have spent decades finding innovative ways to meet their community’s needs—and public education has been at the top of their agenda. As actively engaged philanthropists and changemakers, the Goodmons have promoted effective and high-quality human services for disadvantaged people and communities and spearheaded efforts to ensure North Carolina’s citizens have access to first-class early childhood education and public schools across the state. To purchase event tickets, click below. If you are interested in sponsorship opportunities, please contact Marisa Bryant at [email protected]. 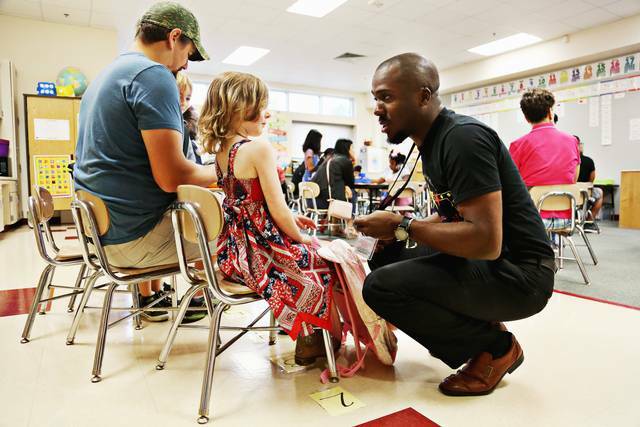 Photo Credit: Allison Shelley, The Verbatim Agency for American Education: Images of Teachers and Students in Action. Since the U.S. Supreme Court’s landmark 1954 Brown v. Board of Education ruling, the nation has struggled to end racial segregation in public education. A recent study by Duke University researchers Charles Clotfelter, Helen Ladd, and Mavzuna Turaeva and UNC-Chapel Hill professor Steven Hemelt provides insights into the evolving story in North Carolina, a state at the epicenter of the desegregation struggle for decades. The research suggests that the racial landscape in education—and the challenges to achieving more integrated schools—have become increasingly complicated. FutureEd Editorial Director Phyllis Jordan spoke about the study recently with Clotfelter. How do you measure segregation in your study? When social scientists use the term segregation these days, they are usually talking about racial balance. So if all the schools in a district or a county have the same racial composition, we would say they’re racially balanced. Segregated school districts are racially imbalanced; their schools’ enrollments don’t align with racial groups’ district-wide representation. To continue reading the complete interview, click here. Jordan, P. “The Evolution of School Segregation: The North Carolina Story.” FutureEd. 4/1/19. 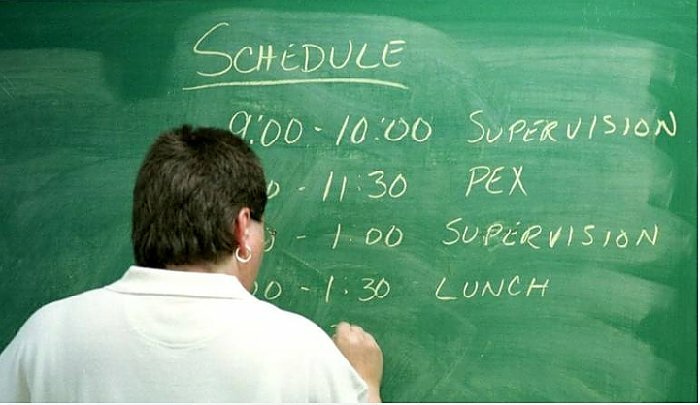 A teacher writes the schedule for the day on her blackboard. Photo Credit: File photo, The News & Observer. After months of debate, the State Board of Education agreed Thursday to rules changes that will make it easier for out-of-state teachers to get a North Carolina teaching license. The state board approved a recommendation from an advisory committee to grant teaching licenses to out-of-state teachers who have high scores on their state’s licensure exam. 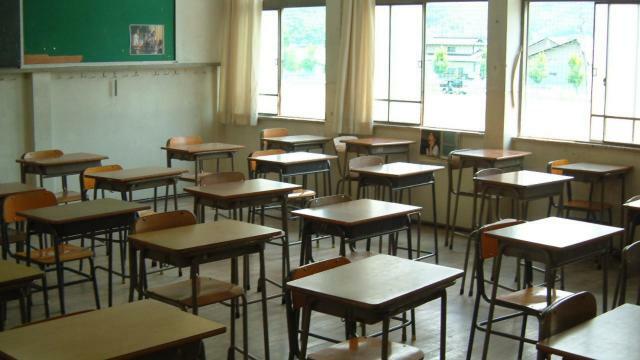 The state board had rejected an earlier recommendation to accept any passing score after expressing concern that the proposal could result in teachers being hired from states with lower standards than North Carolina. Hui, K. “NC will make it easier to hire out-of-state teachers.” The News & Observer. 4/4/19. 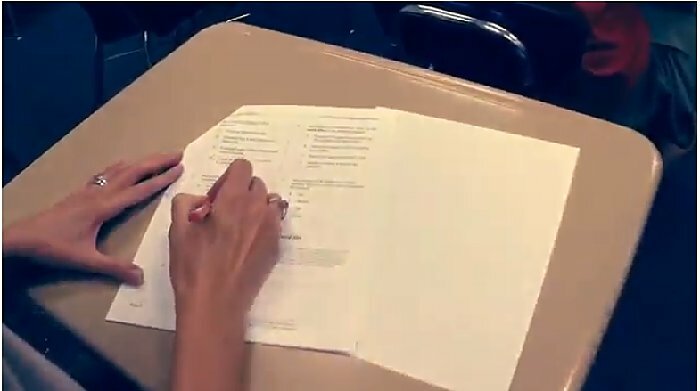 The teachers at Lacy Elementary School in Raleigh have produced a parody video offering strategies for students taking the upcoming state end-of-grade exams. Photo Credit: McClatchy, News & Observer. State lawmakers are weighing different options for how to reduce the amount of standardized testing given to North Carolina public school students. The state House voted 110 to 2 on Wednesday for a bill that overhauls the school testing program and reduces the number of exams given. But in the Senate, lawmakers introduced their own bill Wednesday that would reduce testing in a different way. Hui, K. “NC lawmakers say they wat to reduce student testing. Can they agree on a plan.” News & Observer. 4/3/19. Gov. 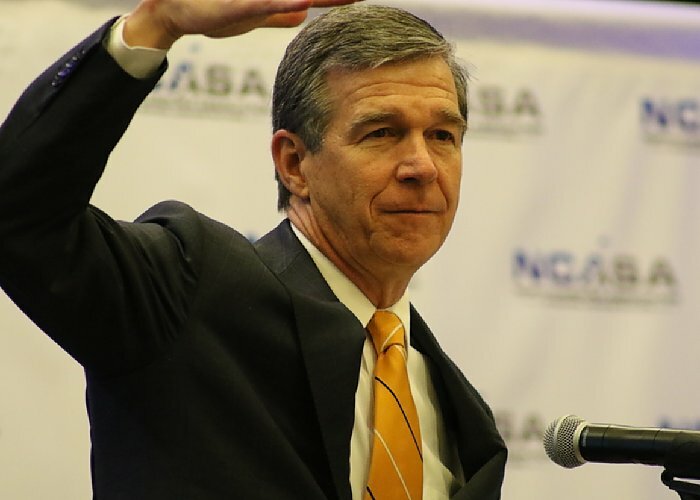 Roy Cooper encouraged a room of administrators Friday to be bold in their advocacy for public education as he accepted the North Carolina Association of School Administrators’ 2019 Champion for Children Award at the organization’s annual leadership conference in Raleigh. Bell, L. “Gov. Cooper talks professionalizing teaching.” EducationNC. 3/29/19. Kindergarten teacher Lequi McLeod, right, greets students individually as they settle into the classroom at Barwell Road Elementary School on Wednesday, July 25, 2018. Legislation filed in the N.C. Senate would allow retired teachers to teach at Title I schools like Barwell without hurting their pension or retirement benefits. Photo Credit: Juli Leonard, The News & Observer. Some powerful state lawmakers have introduced legislation to encourage retired North Carolina teachers to return to teach in high-needs public schools. Senate Bill 399 filed Thursday would let retired teachers work at Title I schools or schools that receive a D or F grade under the state’s school performance system without it hurting their retirement benefits. Teachers could earn $35,000 to $40,000 a year and still collect their current pensions. Hui, K. “NC wants retired teachers back. Bill would let them teach without hurting benefits.” The News & Observer. 3/29/19. ‘If Some Things Need Fixing, Let’s Fix Them.’ NC Leaders Want to Improve Read To Achieve. Senate leader Phil Berger announces legislation designed to get more children reading at grade level by the end of 3rd grade. Reading performance for 3rd-grade students has actually dropped since the Read To Achieve program was launched in 2012. Photo Credit: Travis Long. North Carolina leaders are making a new push to help young children to read, announcing changes Monday to the Read to Achieve program which has so far failed its goal of getting more children to read by third grade. Since 2012, the state has provided at least $150 million to the Read to Achieve program to try to get more students proficient in reading by the end of third grade. With test scores not having increased, Senate leader Phil Berger filed a new bill Monday that would make changes in how reading is taught and how teachers are trained in teaching literacy to their students. Hui, K. “‘If some things need fixing, let’s fix them.’ NC leaders want to improve Read To Achieve.” The News & Observer. 4/1/19. State Superintendent Mark Johnson and Republican lawmakers announce a bill on April 3, 2019, to give teachers $400 for classroom supplies. Photo Credit: Kelly Hinchcliffe, WRAL. 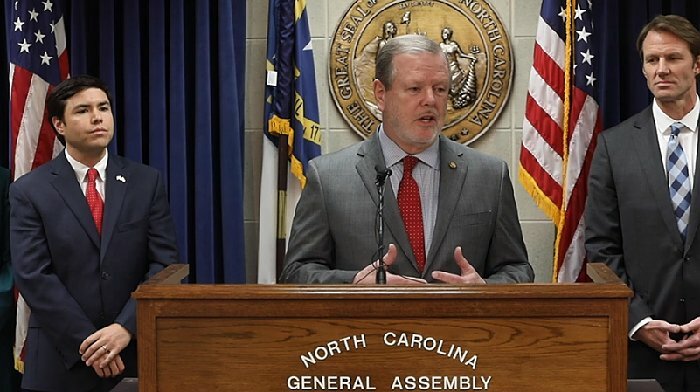 Superintendent of Public Instruction Mark Johnson and several Republican lawmakers announced a bill Wednesday that would give every licensed public school teacher in North Carolina $400 to buy school supplies instead of sending that money to local school districts. If passed by the General Assembly, the North Carolina Classroom Supply Program would begin with the 2019-20 school year and would be mandatory for traditional public schools and optional for charter and independent schools, using their available funding. 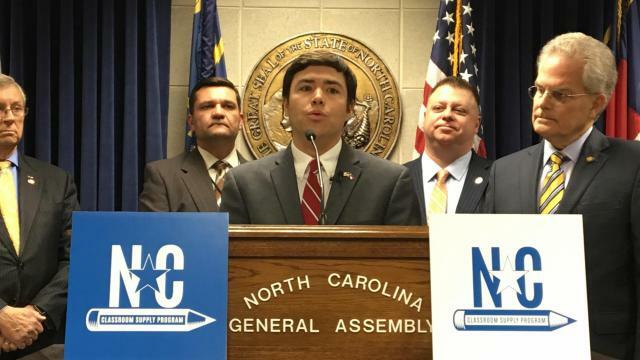 Hinchcliffe, K. “Bill would give teachers $400 to buy supplies, but two NC Teachers of the Year don’t support it.” WRAL. 4/3/19. Photo Credit: Aaron Ontiveroz, The Denver Post via Getty Images. The Chan Zuckerberg Initiative announced Monday it is providing more than $1.6 million over two years to the Jefferson Education Exchange, a nonprofit that helps educators nationwide make informed decisions about education technology. The grant will enable the Jefferson Education Exchange to create a system for measuring how various ed tech tools work in different school contexts. Fay, L. “Chan Zuckerberg Initiative Will Give $1.6 Million to Study Educators’ Experiences With Ed Tech.” The 74. 4/1/19. Photo Credit: Element5 Digital, Unsplash. When it comes to learning, money matters, and state leaders aren’t providing schools with enough of it for their students to meet national average test scores, according to a new research paper issued by the Albert Shanker Institute and co-authored by Bruce Baker, a top school finance expert from Rutgers University. Burnette II, D. “States are Spending Way Too Little on Schools, Report Concludes.” Education Week. 4/3/19. A view outside of Indiana Virtual School’s office, located in an office park at the northern edge of Marion County. Photo Credit: Shaina Cavazos, Chalkbeat. Cavazos, S. and Wang, S. “Some parents say getting help was like ‘pulling teeth’ as troubled Indiana virtual schools grew.” Chalkbeat. 4/2/19. PENC will be hosting it’s 2019 Conference, “Supercharged with STEAM” on May 4, 2019, in Raleigh at the Renaissance Raleigh North Hills Hotel. Attendees will earn 0.5 (digital learning) CEUs while they learn about STEAM Education. STEAM is showing success in schools all around the world to better teach academic and life skills in a standards-backed, reality-based, personally relevant exploratory learning environment. It is a framework for teaching that is based on natural ways of learning, customizable for ALL types of students and programs and is FUNctional! Keynote speaker Jan Hargrave, author, an expert in the field of nonverbal communication will teach you how to improve your communication skills in order to become a more effective communicator. Her information could help you to “read” your family, your students, your associates, in fact, everyone around you. Bring your body, your curiosity, your sense of humor and learn what your body – and the body of others – is communicating to the world. Visit www.pencweb.org/2019-conference for more details and to register! Purchase orders may be used for school groups! Please contact Alex Cozort at [email protected] with any questions or for more information. Schools That Lead, in partnership with the NC General Assembly and the NC Department of Public Instruction, is excited to announce it will launch its second cohort of North Carolina Networked Improvement Communities for public schools seeking to improve learning outcomes for their students. In this network, principals and teachers learn to use improvement science to articulate their theories and assumptions, select change ideas and measure impact over time as they work to solve a common problem, seen here by school level. Elementary schools: Reducing the number of students who have below grade level academic performance, and/or chronic absences and/or behavioral issues. The total three-year membership fee is $6,000 per school, payable to Schools That Lead in $2,000 increments each year of the three-year program, or by other mutually agreeable terms. Schools should also budget for the costs of travel and substitute teachers for the professional learning sessions. Applications are due April 15, 2019 by 12:00 p.m. and are to be completed by the school principal. Schools will be selected by lottery (if necessary) and notified of selection by May 1, 2019. The first convening of selected schools will be held in the Raleigh/Durham area in September 2019. 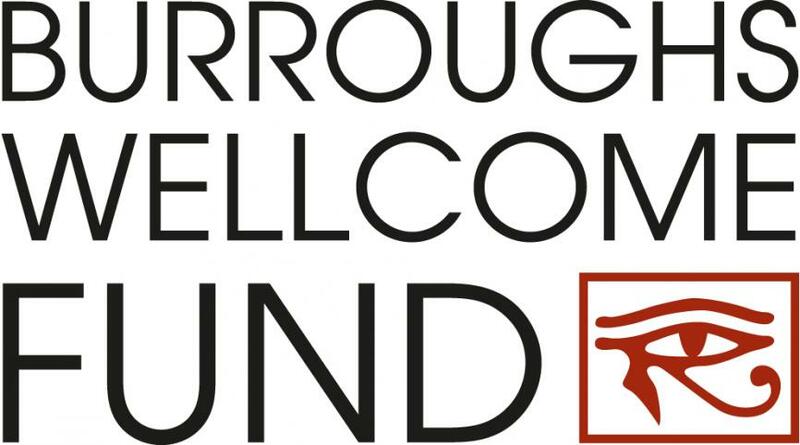 The Burroughs Wellcome Fund has opened its application for the 2019 Student STEM Enrichment Program (SSEP) grant awards. SSEP supports diverse programs with a common goal: to enable primary and secondary students to participate in creative, hands-on STEM activities for K-12 students and pursue inquiry-based exploration in BWF’s home state of North Carolina. These awards provide up to $60,000 per year for three years. The application deadline is April 16, 2019. 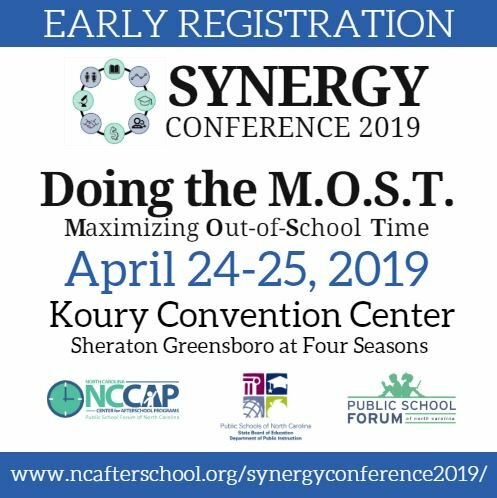 The Synergy Conference 2019 for afterschool professionals will convene April 24-25, 2019 at the Koury Convention Center in Greensboro, NC. This year’s conference is themed “DOING THE M.O.S.T. : MAXIMIZING OUT-OF-SCHOOL TIME”. The conference timeline can be viewed here. Early Registration is now open for the annual SYNERGY CONFERENCE! You can register here by February 10th for the discounted rate of $200. Regular registration will begin on February 11th at the regular rate of $225. We are excited to announce that Mentoring has been added as a new workshop strand. Workshop strands include Arts & Literacy, Closing Gaps, College & Career Readiness, Mentoring, Organizational Capacity, Public/Private Partnerships, S.T.E.M., and Youth Development. Byron V. Garrett will be this year’s lunch and award ceremony keynote speaker. One of the most compelling voices of our time, Byron V. Garrett is Chairman of the National Family Engagement Alliance (NFEA); a nonprofit dedicated to transforming education through meaningful family engagement. Byron is the Founder & Chief Visionary Officer of The Valdecio Collection, a lifestyle brand consisting of clothing, watches and fragrances. The former Director of Educational Leadership & Policy for Microsoft, Byron is a consulting author for Scholastic and released the Byron V. Garrett Social Emotional Learning Collection in 2017 to foster social and emotional learning in today’s classrooms. 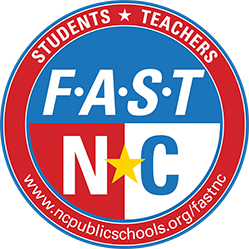 Florence Aid to Students and Teachers of North Carolina – FAST NC – is an effort led by a bipartisan group of current and former North Carolina education leaders to help the state’s public schools as students and educators struggle to return to normal following Hurricane Florence and its impact.